In Matthew 12:38 Jesus was asked for a sign to show that He was the promised Messiah. The religious officials had just accused Him of using the power of Satan to perform His miracles, and so He described the only sign they would see. "Just as Jonah was three days and three nights in the belly of a huge fish," He said, "So will the Son of Man be three days and three nights in the heart of the earth (Matt. 12:40)." By this He meant that because of their hardened hearts they would only know for sure that He was their Messiah after He rose from the dead, an unmistakably miraculous sign. History shows they didn't accept even as incredible a sign as this, but His response has resulted in a 2,000 year controversy surrounding the time of His death. People who were unfamiliar with the sequence of the spring Feasts of Israel determined that the phrase in John 19:31 identifying the day after the crucifixion as a special Sabbath meant that Jesus was crucified on a Friday, because everyone knows that the Jewish Sabbath is Saturday. And almost everyone agrees that He rose again on Sunday. But there isn't any way you can put three days and three nights between Friday afternoon and Sunday morning. Hence the controversy. So let's set the record straight. Sabbath is a Hebrew word that means means "rest" and refers to holy days when no work is allowed. There is one every Saturday in Israel, but there are also several during the year that are date specific. That means they are always observed on a specific calendar date, regardless of the day. They're like our Christmas. Every year it comes on the 25th of December no matter what day of the week that happens to be. 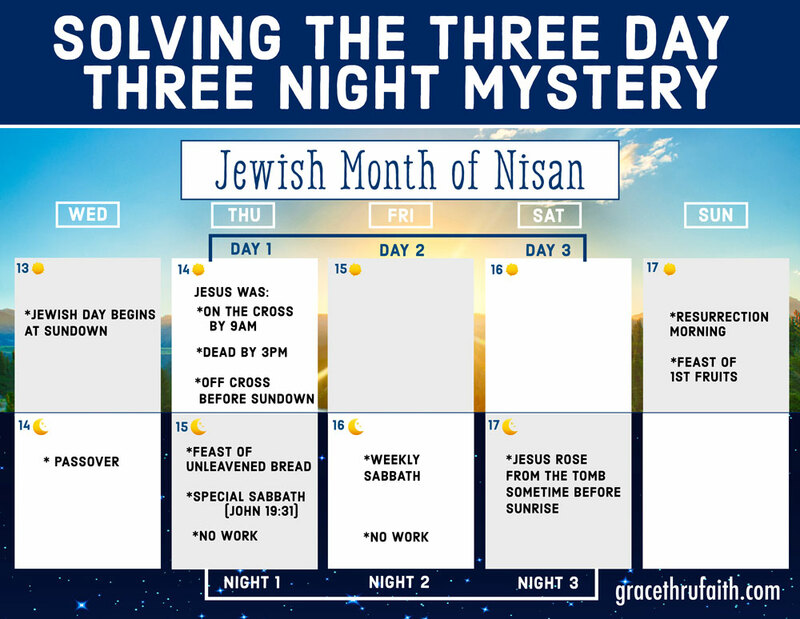 The special Sabbath John referred to is the Feast of Unleavened Bread, and it's a date specific holy day; always observed on the 15th of the month they call Nisan, which corresponds to March/April on our calendar. So the first thing we learn is that the special Sabbath mentioned in John 19:31 didn't have to be a Saturday. Originally there were four special days in the month of Nisan. The first was Passover on the 14th. Then the Feast of Unleavened Bread which began on the 15th and ended on the 22nd, both of which were special Sabbaths. And finally, there was the Feast of First Fruits which fell on the Sunday morning following Passover (Leviticus 23:4-14). Of the four, only the two that opened and closed the Feast of Unleavened Bread prohibited work like the weekly Sabbath, but all have both a historical and prophetic purpose and like all days in the Jewish calendar they begin at sundown, following the pattern of Genesis 1 where God repeated the phrase, "and there was evening and there was morning" six times, once for each day of creation. The next issue we have to consider is the sequence of events in the week we call Holy Week. In Exodus 12:1-13, where the Passover was ordained, we learn what that sequence was. God told the Israelites to select a lamb on the 10th day of the month and inspect it for defects until the 14th. This means through the end of the 13th. Then at twilight they were to slaughter and roast it, eating it that same evening, as the 14th was beginning. Using some of its blood they were to paint their door posts red to protect them from the plague coming upon Egypt at midnight. Jesus came to fulfill the prophecy of the Passover Lamb, to save from death everyone who spiritually applies His shed blood to their lives. The only day He ever allowed the people to hail Him as King was on the day we call Palm Sunday, and as we'll see it was the 10th day of the month. He did this to fulfill the selection process for the Passover Lamb. When the officials told Him to rebuke His disciples, He said that if they became quiet, the very stones would cry out (Luke 19:40). For this was a day ordained in history. It was the day He officially presented Himself as Israel's Messiah, the Lamb of God who takes away the sin of the world (John 1:29). It was 483 years to the day from the issuing of the decree to restore and rebuild Jerusalem, spoken of by Daniel the Prophet (Daniel 9:25). A little while after the officials cautioned Him, He condemned Jerusalem to utter destruction because they did not recognize the day of His visitation (Luke 19:41-44). Some years before the birth of Jesus, the Passover celebration had been changed and in the Lord's time called for a brief ritual meal of lamb, unleavened bread, and bitter herbs (horseradish) to begin the 14th followed by a great and leisurely festival meal on the 15th, when the Feast of Unleavened Bread begins. This meal is called the Passover Seder. The 14th became known among the people as Preparation Day , because during the day they made ready for the great feast day beginning at sundown, after which no work was permitted. Mark 15:42, Luke 23:54, John 19:31 all identify Preparation Day as the day of the Lord' s death, while Matt. 27:62 says the day after the crucifixion was the day after Preparation Day. So all four Gospels agree; Jesus died on Preparation day, the 14th of their month Nisan, which is Passover. As evening began the day, He ate the ritual meal with His disciples in the Upper Room, and then was arrested, tried, convicted, and put to death; all on Passover. So just like the Lord had commanded in Exodus 12, our Passover Lamb was selected on the 10th, inspected on the 11th, 12th, and 13th, and executed on the 14th of Nisan. A little over 100 years ago a believer named Robert Anderson was head of Scotland Yard's investigative division. He became intrigued by the three days and three nights issue and enlisted the help of the London Royal Observatory to investigate the problem since astronomers can locate the exact position of the planets and stars on any date in history. Since Passover always falls on the 14th, and since the Jewish calendar is lunar (moon) rather than solar (sun) oriented, there is always a full moon on Passover. This fulfills Genesis 1:14. Plotting the course of the Sun and Moon they documented the day and date of every full moon. The Royal Observatory discovered that the first Palm Sunday was the 10th of Nisan, the day when Exodus 12 says to select the lamb. Therefore Passover, the 14th, was a Thursday. The Feast of Unleavened bread began on Friday the 15th, Saturday the 16th was the weekly Sabbath, and Resurrection Morning was also a Sunday, the 17th, when the Feast of First Fruits was celebrated. From Thursday to Sunday there are three days and three nights. It's a little confusing to our way of thinking because the Hebrew day changes at sunset, which means that night precedes day. But read carefully and you'll see that it makes sense. As I've said, Jesus had to die on Passover to fulfill the prophecy. Early that Thursday morning the Jewish leadership had gotten permission to crucify Him. (Matt. 27:1-26) His fate was sealed and He was hanging on the cross by 9 AM, as good as dead. His actual time of death was about 3 PM and His body was laid in the tomb sometime later, since the officials wanted it off the cross before sundown brought the Feast of Unleavened Bread, after which no work was permitted. By then Jesus had been in Sheol for several hours. Thursday was day one. Because in Jewish reckoning the night precedes the day, at sundown it became Friday the 15th, night one, and the special Sabbath John mentioned began (John 19:31). At sunrise it was Friday morning, and day two began. The next sundown brought Saturday night the 16th, night two, and the regular Sabbath began. As of sunrise it was Saturday day, the beginning of day three. At sundown on Saturday it became Sunday night the 17th, night three, and sometime before sunrise Jesus rose from the tomb. Three days and three nights. When the women arrived at sunrise to anoint His body early in the morning, He was already gone. So in the week Jesus died two Sabbaths that permitted no work were observed back to back: The Feast of Unleavened Bread on Friday the 15th, and the regular weekly Sabbath on Saturday the 16th. In Matthew 28:1 we read that at dawn on the first day of the week (Sunday the 17th) the women who were close to Jesus went to the tomb. Luke 24:1 tells us they were going to anoint His body for burial. The two consecutive Sabbaths had prevented them from doing so earlier (Luke 23:55-56). But He wasn't there. He had risen. Being the Sunday after Passover, at the Jewish Temple it was Feast of First Fruits. At the Empty Tomb it was Resurrection Morning. How Can We Confirm This? Some people try to equate his time of death with the burial of His body and say you can't count Thursday as day one, because His body wasn't laid in the tomb until sunset was upon them. But that doesn't make sense. A person's death always precedes his or her burial, sometimes by several days. In the Lord's case it was several hours between the time He died and the time His body was laid in the tomb. The two disciples who met the Lord on the road to Emmaus that Sunday (the day the Lord's resurrection was discovered) help us to confirm this (Luke 24:13-35). At first they thought the Lord must have been a very recent visitor to the area when He asked them to explain why they were so sad. In the course of the discussion they indicated it was the third day since the crucifixion. "Since" is roughly equivalent to "after". It being a Sunday, the previous day (Saturday) would have been the 2nd day since it happened , and Friday would have been the first day since it happened, making Thursday the day it happened. Others argue that this view doesn't permit three full days and three full nights in the tomb but that's not what the Scripture says. It simply says three days and three nights. If you move his death up to Wednesday to get three full days you violate the Passover Lamb prophecies, the women wouldn't have waited until Sunday morning to prepare the Lord's body because they could have done it on Friday, and the disciples on the Emmaus road would have said Sunday was the fourth day since the crucifixion. So the Thursday date is the only one that will accommodate both the Passover Lamb and the three day three night prophecies. Mystery solved. Most of us see our "day" beginning when we get out out of bed in the morning, but the reality is that it began hours before, at midnight. If you keep that subtle difference in mind, it shouldn't be too difficult to back up a few more hours to sundown of the previous day. That's when the Jewish calendar day began. In this calendar, each column represents one day of the week, just like your daily calendar. The top row represents the daytime hours while the bottom row represents the nighttime hours, just as you're used to. The difference in this calendar is in the dating. Since the Jewish day begins at sundown, the first half of each day is shown on the bottom half of the calendar. To follow that day to it's completion, you jump to the top of the next column to the right.